At a cheese and wine party recently, one of my friends commented on the remarkable aroma of strawberries wafting from one of the wines. Someone nearby guffawed at the non-existent joke and made an infantile comment that surely wine should smell of grapes. 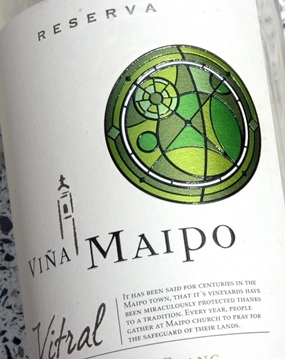 Maipo’s “Vitral” motif on the Sauvignon Blanc label. 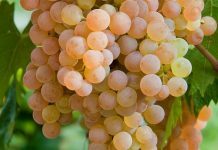 Chilean Sauvignon Blancs are very different to some of the austere Sauvignons of New Zealand and the Loire Valley, which can sometimes be strident and acidic. Viña Maipo’s head wine maker Max Weinlaub has tamed the Wild Lady of the Loire into something quite different. I think he has emphasized the grape’s more feminine qualities. In the near-perfect climate of Chile’s Maipo Valley, the Sauvignon Blanc (SOH-vee-nyon BLAHN) shows its more charming side. 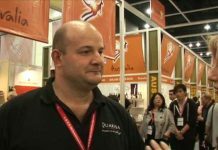 A little bit of the prima donna is still there though; that typical flinty, mineral touch on the palate, just to remind us of its French ancestry. You may not know that the Spanish word vitral means “a stained glass window” and neither did I until I ferreted through the browned pages of my old Spanish dictionary. This is evidently a reference to Maipo’s famous sixteenth century church and how the vibrant colours of the stained glass represent the purity of the wines. Or something like that. This award-winning wine is a lovely yellow colour with hints of green and although it looks like a typical Sauvignon Blanc you’ll find it’s rather special because it has a gorgeous, sweet floral aroma that is a delight to savour. There are gooseberries and peaches up-front with white flowers, hints of honey, citrus and passion fruit. The palate is soft and round with ripe peachy fruit and a lovely tang of crisp citrus acidity. It’s light-to-medium bodied with that extraordinary ability to “blossom” in the mouth leading to a long, dry and satisfyingly crisp finish. I’d be perfectly happy to enjoy this wine on its own for the rest of the evening, but at 13% alcohol content you may prefer it with food. It would work well with grilled fish dishes or even light chicken meals and would make a perfect partner for Camembert and Brie. It would make a superb apéritif, if you want to kick off the evening with a bit of style. 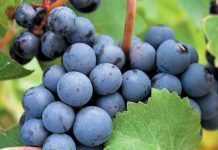 This is another award-winning wine – a dark ruby-red Syrah (see-RAH) with a complex aroma that should keep you busy for several minutes if you feel so inclined. First you’ll probably notice the aromas of black fruit, plums, blackberries and cherries. Swirling the glass around for a bit should release an unmistakable tang of spice, currants and just a hint of rich, dark Swiss chocolate. Like I said, it’s a complex aroma. For some reason, I was expecting the wine to resemble a typical Australian Shiraz (Syrah and Shiraz are different names for the same grape) but I couldn’t have been more wrong. The mouth-feel is soft and fruity and the taste has an elegant dryness, a dash of acidity with very soft but well-defined tannins. It’s a round, very dry and medium-bodied wine with a lovely balance. There’s a long and perfectly balanced finish too, which just goes on and on. In many ways this is an exceptional wine that’s very refined, yet still fun and interesting to drink. I think it would make an excellent partner for roast meat, lamb and many cheeses. And just think for a moment: this superb wine was once sap in a stick.